McDonald’s Singapore has constantly churned out hyperlocal food. From the Nasi Lemak burger, to the Chendol McFlurry, we’ve had it all. However, McDonald’s Singapore isn’t the greatest purveyor of hyperlocal fast food. After all, McDonald’s is global. 2017 saw the sale of D24 Durian McFlurry in McDonald’s outlets in Malaysia, to the envy of Singaporeans. 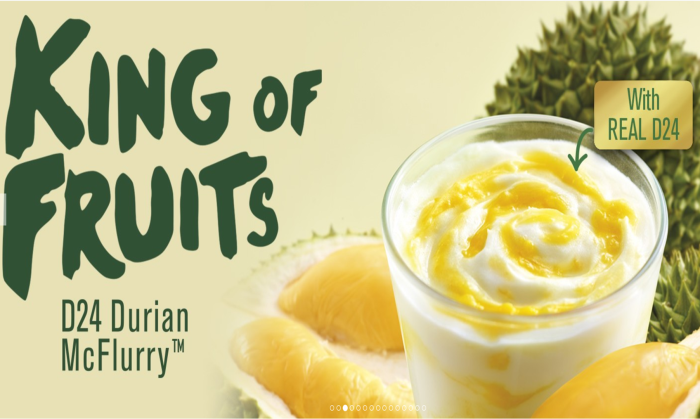 Come 5 July 2018, Singaporeans can channel all this green energy elsewhere because we’re FINALLY getting the D24 Durian McFlurry too! While I’m not a big fan of durian, D24 or not, I am the exception rather than the norm. Singaporeans love their durian and durian-flavoured anything really. Except durian hot pot. That shouldn’t be a thing. McDonald’s claims that this D24 Durian McFlurry will be made with REAL D24 durian. I remain skeptical because it took them years to start claiming that their fries are made with real potatoes. For those of you who’ve tried the D24 Durian McFlurry in Malaysia last year, they only used durian syrup despite saying that they use real D24. So manage your expectations for this upcoming one. And for those of you thinking of trying durian, this is a good place to start. The D24 Durian McFlurry will be available from 5 July 2018 at all McDonald’s outlets islandwide. Hopefully it won’t vanish as quickly as the McGriddles did.